It is happening Wednesday July 26th, at 9 pm at Duke’s Passage in Korčula City. In the framework of my joint residency « Underwater: Escaping (sound) Pollution » with Robertina Šebjanič at Siva Zona / gray) (area, the art gallery directed and curated by Darko Fritz, I shall tell the story of The Jellyfish and the Moon, written by Fabienne Gambrelle and illustrated by Anaïs Tondeur and Gabriel Grandry with music acompaniment by Robertina Šebjanič and Manja Ristić. 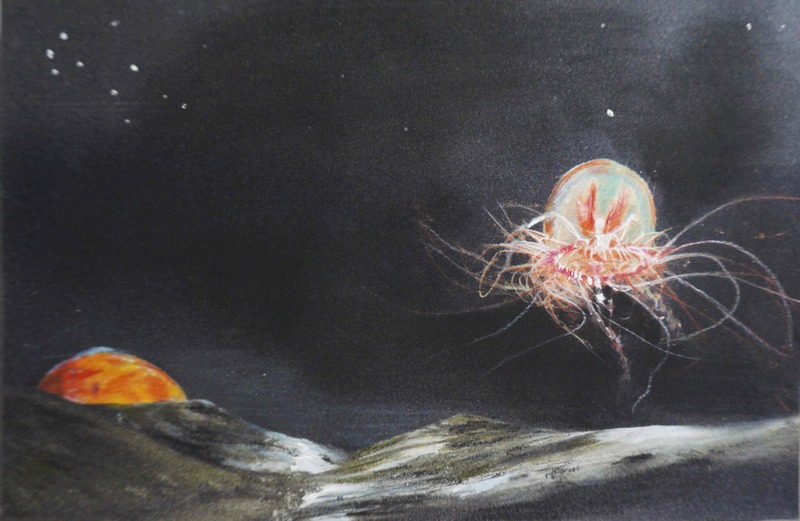 Meant as a children book, the Jellyfish and the Moon is a contemporary tale of a jellyfish trying to avoid the (sound) pollution and disturbance generated by tourism by escaping to the Moon where she dreams for a better world. Robertina Šebjanič will then perform Aquatocene in which the sound of the underwater pollution is at the core of the sound compositions. She will be joined by Manja Ristić, a violinist who plays the violin as an all-encompassing sound facility with a poetic sonic range of unconventional sound creation possibilities. Ce contenu a été publié dans Annick's News, Anouncement, Art & Non Human, Art & Non Human, Art-Science, Art-Science, Extreme Environment, avec comme mot(s)-clé(s) Anaïs Tondeur, Annick Bureaud, Aquatocene, Gabriel Grandry, Jellyfish, Korcula, Moon, underwater pollution. Vous pouvez le mettre en favoris avec ce permalien.